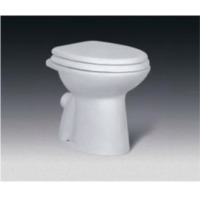 Zhejiang Dafeng Sports Equipment Co., Ltd.
WC pan for high level cistern. This popular model has proved its reliability over the years. Made using our UNIBLOCK II system (internal frame structure made of injected plastic + foam + seamless fabric) it meets all the strictest requirements. The seat and backrest body are made of high-density polypropylene which makes the maintenance and care of the seat simple. The special use of materials applied in the manufacture of this model perfectly exemplifies the capacity for adapting the seat to any kind of hall. Here, its personal character is achieved through the uniformity of the colours (the same colour for the metal and wooden parts) and the inclusion of decorative details (welts with metallic sparkle on the round frame and paint inside the armrest moulding). Thanks to its unusual design, this model allows the use of different colours and materials for its accessories. Short on time? Let public-seats sellers contact you. A luxury seat which is entirely made of wood and is ideal for those halls and auditoria in which exclusiveness is the key feature. Its rectangular sides were designed especially for this model which, with its wooden backing for both seat and backrest, turn it into a small work of art for any hall. The ultimate in exclusivity. This model brings together all the possible advances and options in a seat of this category (any type of fixing and accessories), a special look (curved lines for the seat and backrest) and spectacular comfort, thanks to its size (larger seat and wider backrests with reduce the gaps between backrests). Like our other creations for the cinema, the legs are injection moulded, although a metal version can also be supplied. The inspiration for this model is the classic, elegant design of the GAIETY Theatre, on the Isle of Man, Great Britain, a gem of English theatre architecture built by the English architect Frank Match am in 1899. The concept was of a seat whose identifying features are the curved lines of the backrest frame and the long, stylized arms. These parts are made of solid beech wood and complemented by a special velvet fabric upholstery. The possibilities that this seat offers for adapting to a classical theatre or opera house are endless: on the one hand, it offers the latest technology in folding systems, cold-moulded foam and internal structures, and on the other it makes it possible to incorporate classic details such as embroidery, studs for the back, brass plaques or special colors for the metal parts. A huge revolution based on the intelligent design of its forms. On the one hand, the curved lines of the wooden armrests in the shape of a teardrop contrast with the straight lines of the wooden back. On the other, the hollow in the arms improves the acoustics at the same time as creating an innovative extra space - the back, with its upright angle, gives the spectator the perfect ergonomic posture. 1800*670*790mm GW:34KG 1.5mm painting seat 1.2mm die-cast arms/legs 80*40*1.8mm beam. Volume: 0.095cbm Chair body/pack Arms & legs/pack Beam and fittings/pack. A model based on the latest trends in design, with daring straight lines. This seat becomes the leading player in any auditorium thanks to the wood's own elegance and to the broken forms of its sides. Tiny extra details complete the effect (straight seat and backrest, backs lower than the backrest and seat, long armrests) and make it stand out for its highly innovative design. The floor fixing remains hidden in a decorative metal casing. Our montreal seat was created to meet all the possible needs of any cinema or theater. You can choose between the most stylised, strengthened polypropylene sides or traditional steel ones. The higher backrest and its special design ensure perfect comfort for the back. The body of the seat and backrest are made of textured polypropylene. This model integrates classical concepts and versatility in which wood is the predominant feature: a stylised backrest with wooden back and end of row sides also covered with wood, which can be varnished in the colour of your choice. It can be complemented with a writing flap. One of our most famous creations thanks to its versatility. Perfect for cinemas and conference halls, this model incorporates our latest technological innovations, such as strengthened polypropylene sides and a backrest made using the "UNIBLOCK II" system. New smart way of the out door advertising park and public benches.